A short while ago I bought a Zoom G3 multi-effect pedal for my synthesizers and was really blown away by it. Since then I have really used the G3 quite a bit and have had my eye on the new Zoom G5. Today I got an email from a music store here in Nagano-city, Japan and was told that they had just received a Zoom G5 this morning. I have a friend who works at this particular store and was able to get a nice employee discount so I decided to buy the Zoom G5 and give it try. I haven’t had a lot of time to sit down and play with it today, but I can say the footprint is very good. It’s small, lightweight but sturdy, and in my opinion very cool looking. I plan to use this with synths and keyboards that lack effects and to experiment with different patches that are extremely simple to dial in with the Zoom G5. In fact, that is one thing I’m most impressed with the G5. It’s amazingly simple and fast to use. I really like how you get a nice visual display for each effect and have three dedicated knobs to tweak the parameters. The sound of the effects is fantastic and I do notice it’s better than my G3 but that’s subjective I know. The Zoom G5 appears to be built rather well and the displays are wonderful to see on a dark stage. The looper and built in drum machine are a nice bonus for laying down some nice creative song ideas with effects and I use these features extensively with my Zoom G3. I’m excited to do more with the Zoom G5. Two features missing from the Zoom G5 are (1) and effects send/return loop and (2) midi connectivity. Midi is usually important to me as a synth player, but with the Zoom G5 it doesn’t bother me yet that it’s missing. Perhaps later, but for now I just enjoy the ease of use in allowing me to experiment with a multitude of effects that can be used to create patches with up to 9 effects in total. Wonderful!! The sales clerk at the music shop said there already was a waiting list being generated at the store and he felt the Zoom G5 would likely be a big hit in Japan which is why I ran down today to pick up their only model. Although a good unit, the new Boss GT-100 isn’t selling as well in this particular shop and he thought it likely was due to the price point and the relatively low sales of the Boss GT-10 they had before. Their G3 and now G5 zoom products will likely fair much better although that doesn’t necessarily indicate they are better than the Boss or Line6 models in the store. 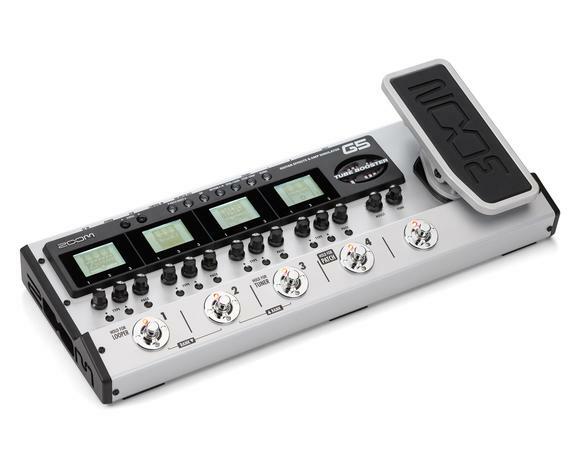 For me, the Zoom G5 is a fantastic solution for experimenting with different effects in a synth or keyboard setup. The simplicity makes it so much fun to use!! I highly recommend the Zoom G5. A friend of mine at a local used music store sold me his almost new Yamaha KX25 controller keyboard last weekend. I must say that I’m really having fun with the Yamaha KX25 primarily because of the fantastic built in arpeggiator function. The majority of the arpeggiated phrases are very musical and useful. Right now I’m find it really fun to control hardware synthss like the DX-7, D-50, and Korg M1. The Yamaha KX25 arpeggiator is very much like the one found in the Yamaha Motif series which opens up a world of possibilities when linked with a hardware synth. As you control the arp with the Yamaha KX25 you can then play melodies or notes using the keyboard you are controlling which gives you kind of split keyboard feel. Thus I can call up a bass patch on the Yamaha DX-7 and choose one of the many cool arp phrases on the KX25. While I’m triggering the arp with the my left hand, I can then play other lines, chords, or runs with my right hand up top on the Yamaha DX-7. You can also press the hold button on the KX-25 to completely remove all hands from the KX25. There are also 4 knobs that can be assigned to volume, envelopes, cutoff, frequency, etc. You can also assign a second set of four commands and toggle between the two for each knob. There also is a second set of modulation and pitch wheels, plus a pedal jack in the back to add a sustain pedal. There is also a midi in and out/thru port which can be connected to any hardware synth or sound module. The Yamaha KX-25 is a little large in dimensions, BUT it’s very light and for triggering arps and playing basslines it’s really good. Like I mentioned above, the Yamaha KX25 is superb for adding an arpeggiator to any synth that lacks one. The arp phrases in the KX25 are some of the best I’ve heard and you can modify tempo, gate, swing, category, and a few other things. The ONLY thing you can’t do is create your own arp phrases, but honestly I don’t think that is really necessary. With a total of 540 phrases/rhythm patterns in the Yamaha KX25, that should keep the creative juices flowing for quite a while. 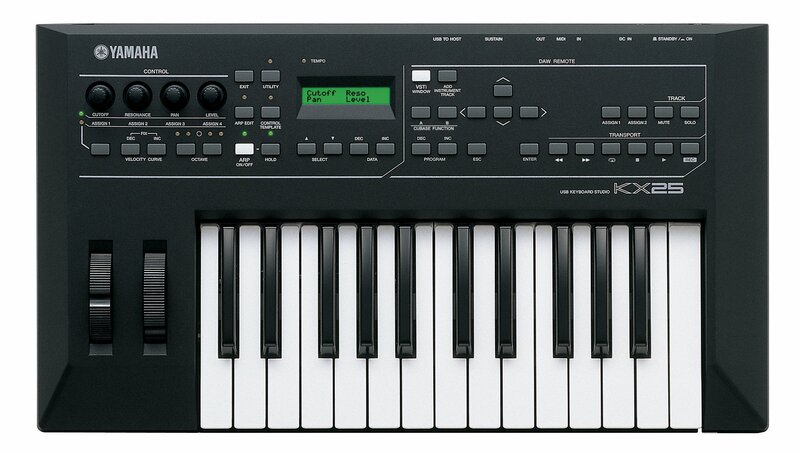 Note that another primary use of the Yamaha KX25 is to hook it up to a computer and control different DAWS, but my intentions are to primarily use the KX25 as a Hardware controller. Having a full blown arp hooked up to an older hardware synth is just killer. It really breathes new life into older machines. If you are looking for a hardware controller with a good built in arpeggiator, I definitely recommend checking out the Yamaha KX25. Here is a great video of Katsunori UJIIE in Japan with a demo of the Yamaha KX series controllers. He talks about the great arpeggiator it has.